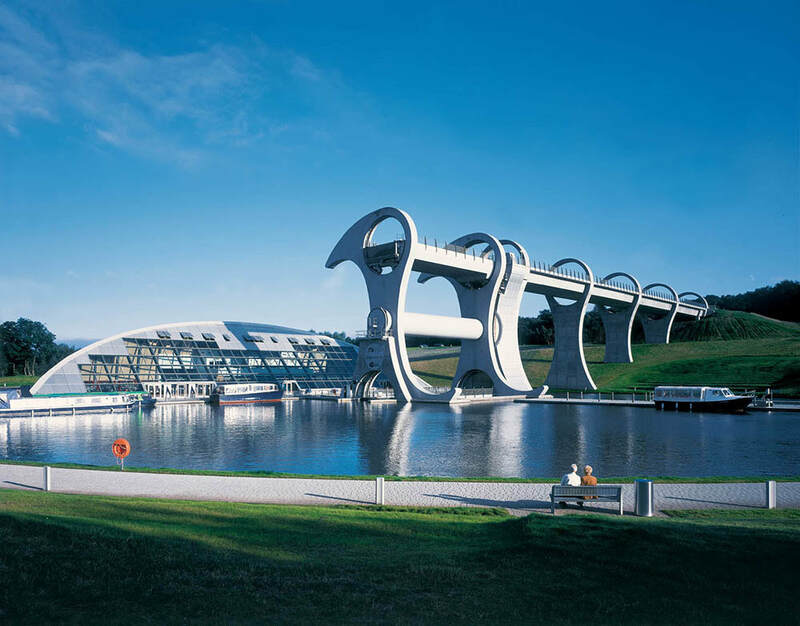 ​The Falkirk Wheel is a 10 minute walk from The Wheel Caravan Park. Rough Castle Tunnel will lead you from the farm into the Falkirk Wheel complex. The Falkirk Wheel is a rotating boat lift, connecting the Forth & Clyde Canal with the Union Canal. Originally the canals were linked by a staircase of 11 locks which took nearly a day to transit. In 1998 work started on the ambitious Millennium Link project to rejoin the two canals, and the world's first and only rotating boat lift was opened by Her Majesty, The Queen in 2002. 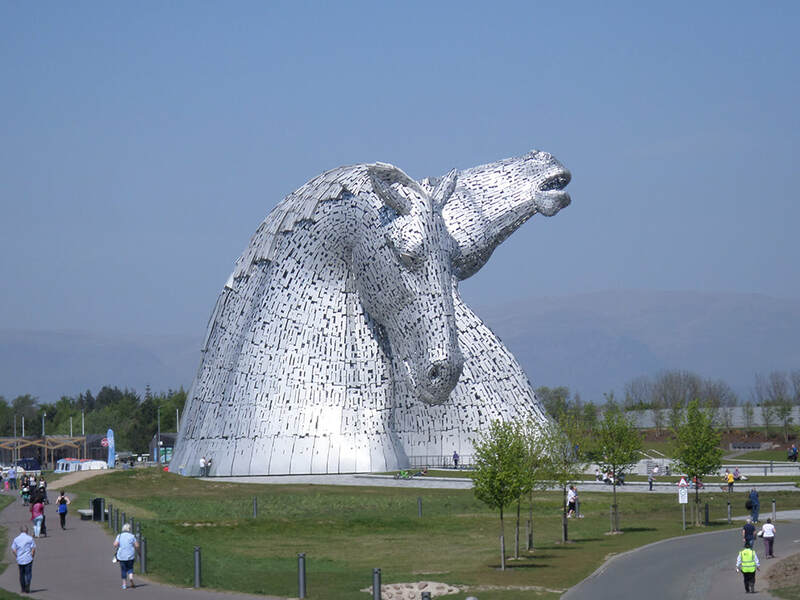 ​The Kelpies is a 20 minute bike ride or 45 minute walk from the The Wheel Caravan Park. You walk through Rough Castle Tunnel into The Wheel complex and adjoin the canal towpaths that lead you to The Kelpies. This is ideal for cyclists and dog walkers, as you don't have to go on the main road. ​The Kelpies are 30-metre-high horse-head sculptures, standing next to a new extension to the Forth and Clyde Canal, and near River Carron, in The Helix, a new parkland project. The Kelpies are built of structural steel with a stainless steel cladding. They each weigh 300 tonnes. 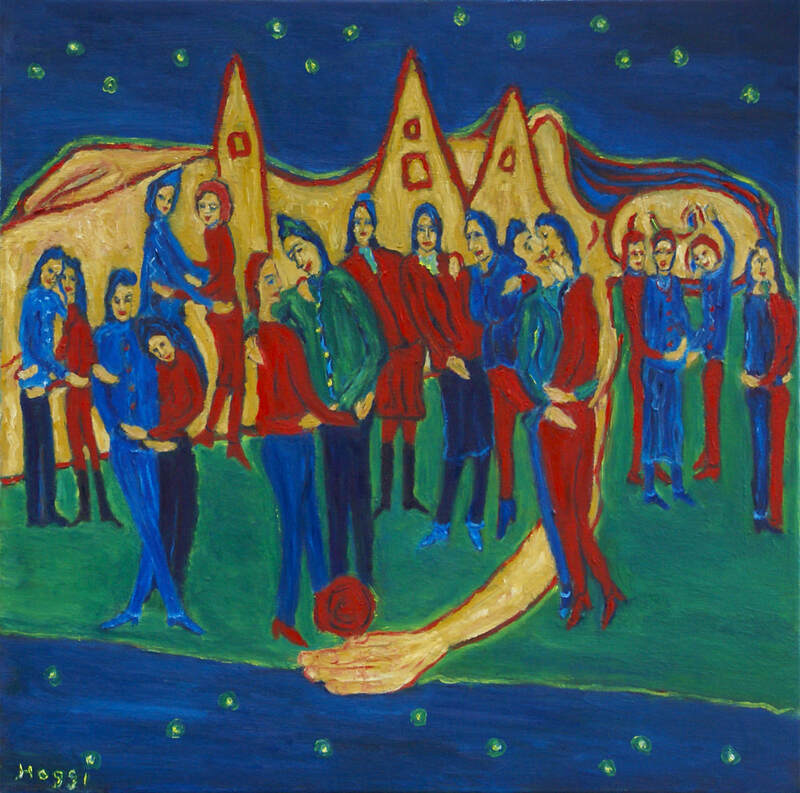 ​UFO sightings in the area have been reported for over a hundred years. 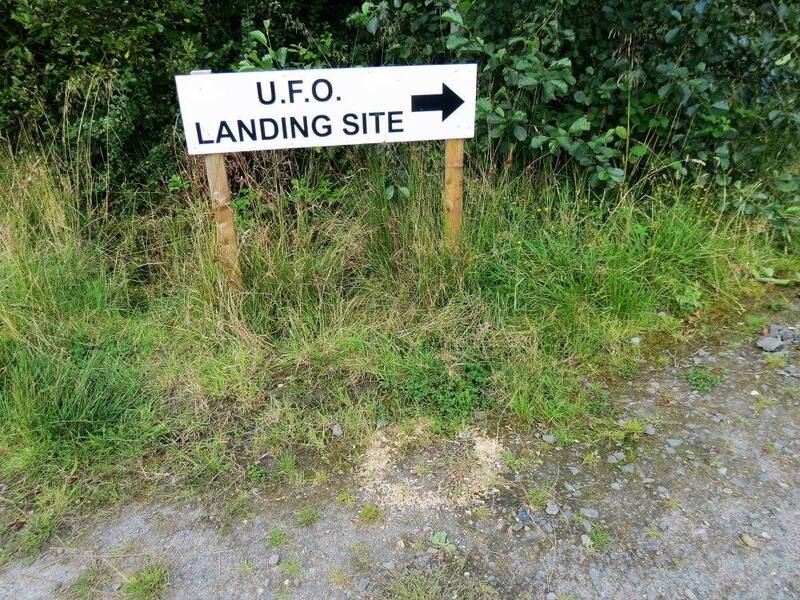 UFO-spotters have named this area the 'Falkirk Triangle', as it boasts over 300 UFO sightings each year. In 2011 it was reported that a UFO landed on Rough Castle Farm approximately two miles from Bonnybridge. ​The Antonine Wall, known to the Romans as Vallum Antonini, was a turf fortification on stone foundations, built by the Romans across what is now the Central Belt of Scotland, between the Firth of Forth and the Firth of Clyde. ​The Antonine Wall was inscribed by UNESCO in 2008, to become part of the Frontiers of the Roman Empire World Heritage Site. 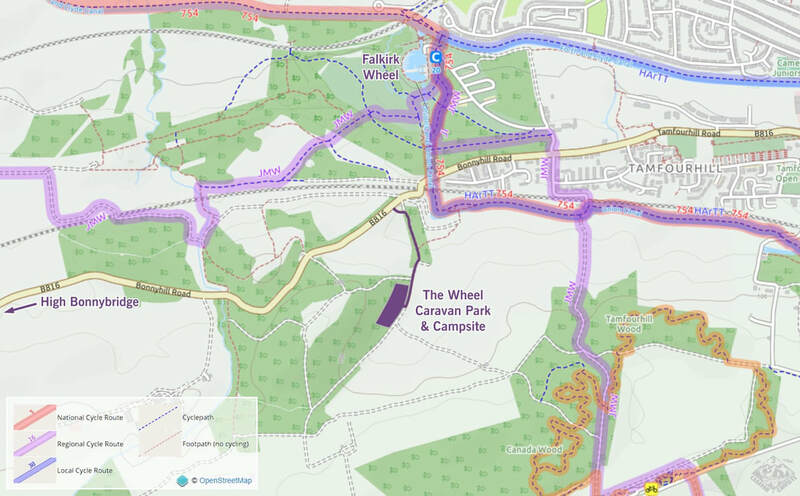 ​There are numerous walks and cycle trails around The Wheel Caravan Park. 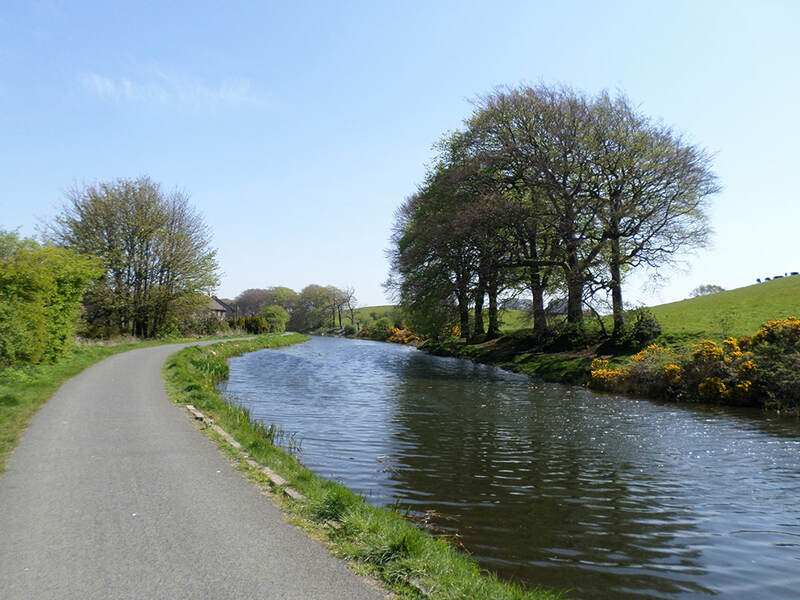 From here it is easy to join the canal paths which will bring you eastwards bound to Edinburgh and westwards bound to Glasgow. Canada Wood Kitchen is a ten minute walk from The Wheel Caravan Park. It boasts beautiful panoramic views towards the Ochil hills. 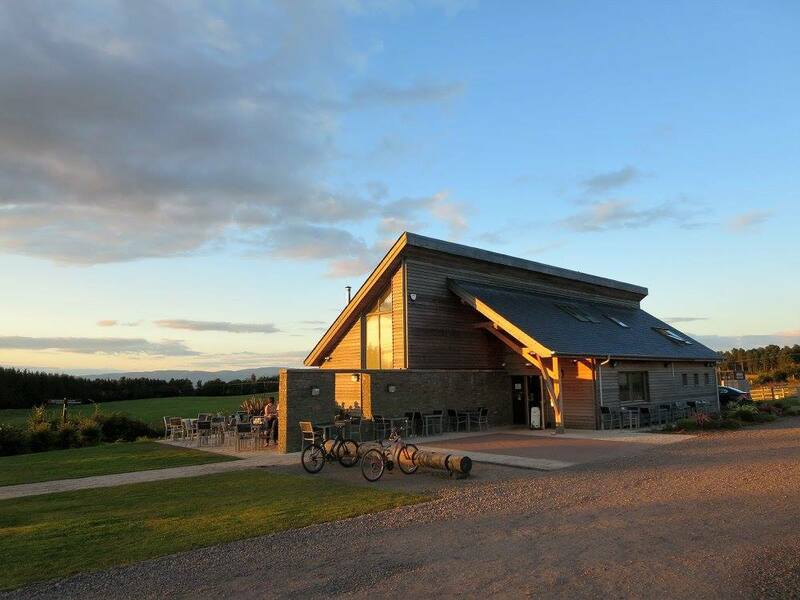 They have a wide range of snacks and menus to cater for many people - foodies, cyclist, walkers, dogs and tourists alike.The menu offers a wide range of locally sourced food and changes on a regular basis. It offers daily specials using the finest fresh seasonal produce. 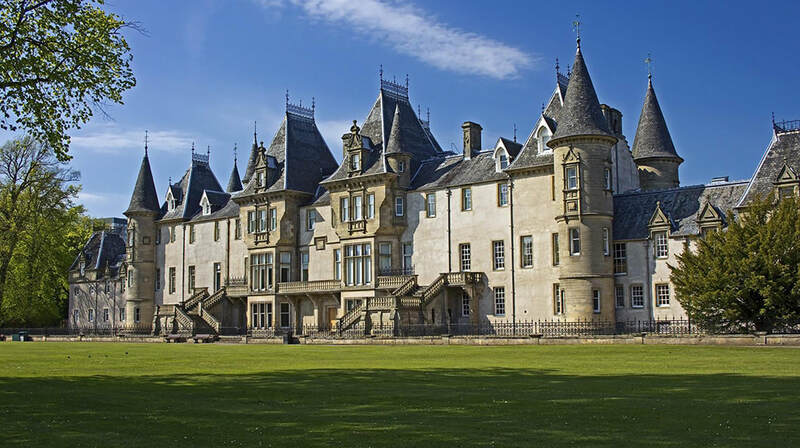 ​Callendar House dates from the 14th century. It is set in the historic designed landscape of Callendar Park, which also contains a section of the Antonine Wall World Heritage Site. Falkirk: Crucible of Revolution 1750-1850. 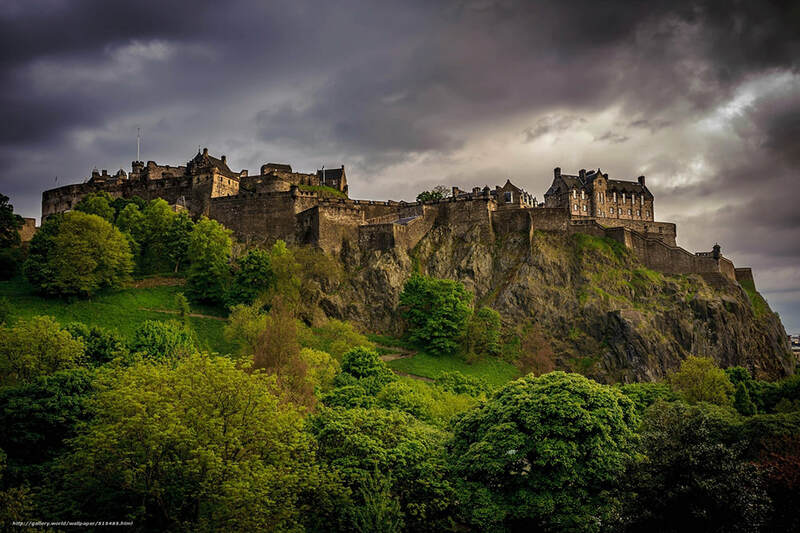 ​Edinburgh Centre is only a half an hour train ride from Falkirk High station. 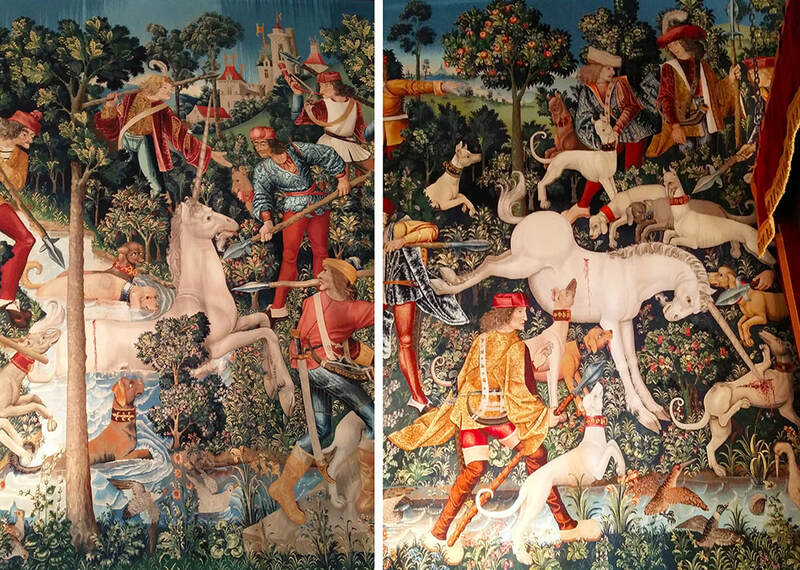 There are 4 trains an hour and is worthwhile a visit. We offer a shuttle service from the caravan park to the station. 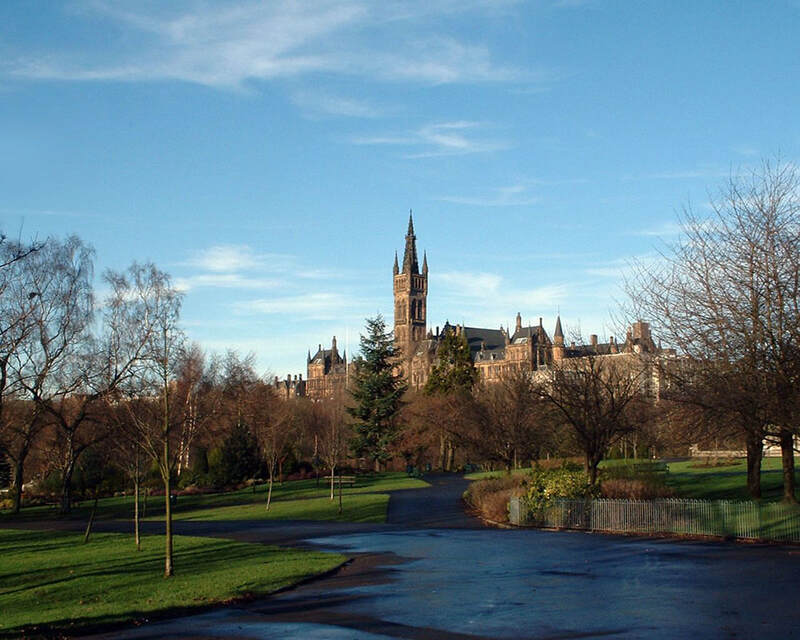 Glasgow Centre is less than half an hour train ride from Falkirk High station. There are 4 trains an hour and is worthwhile a visit. We offer a shuttle service from the caravan park to the station. Stirling is a 15 minute train ride from Camelon station. There are 2 trains an hour. 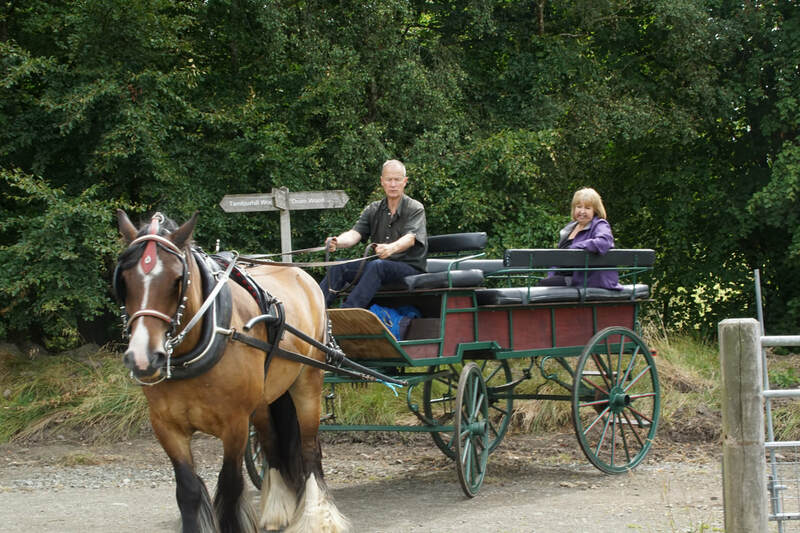 We offer a shuttle service from the caravan park to the station. For more information on all that Falkirk offers as well as a listing of events taking place within the area click here.